A warm bowl of beef stew is perfect for chilly fall evenings. 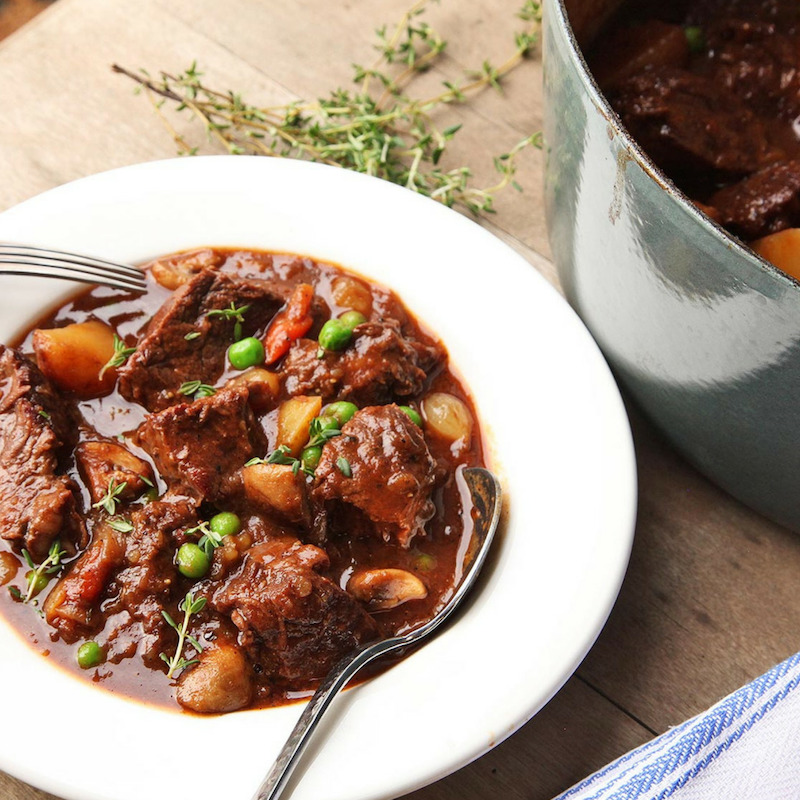 Best of all, stew meat is hearty, healthy, and full of flavour! Season beef with salt and pepper. Add a single layer of meat to the bottom of the pan, and sear for 2-3 minutes. Place beef in the slow cooker. Cook onions, mushrooms, celery, garlic, thyme, and bay leaf in the pan. Add wine and cook until absorbed. Transfer everything to the slow cooker, cover, and cook for 4 hours on low. Stir in barley and cook 2 more hours. Delicious! We love a classic recipe! Blend stock, gelatin, tomato paste, soy sauce, anchovies, and Worcestershire sauce. Season beef with salt and pepper, and place in Dutch oven. Cook beef for 10 minutes and set aside. Add mushrooms, diced carrots, and pearl onions to Dutch oven. Cook, then add yellow onions, whole carrots, celery sticks, and garlic. Add wine or sherry and cook until reduced. Add beef back to Dutch oven, and put in bay leaves and thyme. Cook for 1 hour 30 minutes, add potatoes, mushroom, pearl onions, and carrots. Cook 1 more hour. Stir in peas, season to taste, and enjoy! Add chicken stock to a bowl. Sprinkle gelatin evenly all over surface. Season beef with salt and pepper, and add to Dutch oven. Cook for 10 minutes and remove. Add split carrots, split parsnip, halved onions, and garlic to oven. Add stock, gelatin, coffee, chocolate, Guinness, bouquet garnis, fish sauce, soy sauce, and Worcestershire sauce. Add beef to oven and cook for 1 hour. Add reserved veggies and cook 45 minutes more. Cook beef and onion in a skillet. Add garlic and chopped green pepper, cook for 1 minute. Transfer beef mixture to the slow cooker. Add salt, pepper, beef stock, tomatoes, mushrooms, and barbecue sauce. Cover and cook on low for 7-9 hours. Add cornstarch mix to crock pot and cook for 10-20 minutes more. Ready to cook up a pot of beef stew at home? Visit our NEW online store, and check out our Beef Staples Box. You’ll receive 1lb of nutritious and flavourful stew meat!